Getting Crafty with Jamie: Join me on the lake! Join me on the lake! Do YOU Want to JOIN ME on Big Bear Lake?? Join Me TOMORROW ~ Live!! I have so many exciting things happening Right Now in my crafting world - I can't wait to share it with YOU. You'll be able to talk to me, see me live, ask any questions and more. You do not have to be on Facebook to join this fun EVENT! 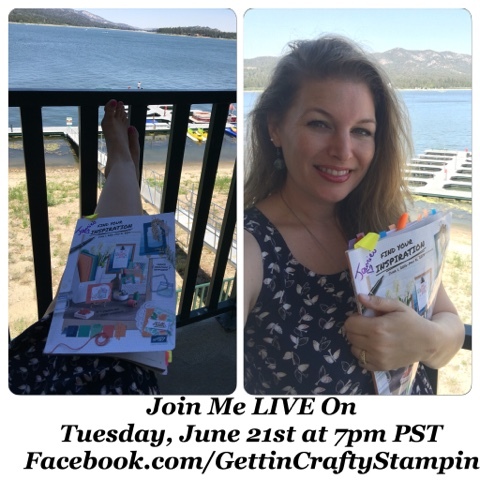 Interact with me, talk to me, see alllll about the upcoming Gettin' Crafty Stampin' Crafting Retreat on Big Bear Lake and how to save when you grab the Best Deal in Town.. the Starter Kit with TWO Free Stamp Sets offered Right Now! !